Three culinary specialists with the amphibious dock landing ship Oak Hill prevailed Friday at the fourth annual Best of the Mess competition in Virginia Beach, Va.
Six teams of Navy cooks went spatula-to-spatula at the event, put on by the Chief Petty Officer Scholarship Fund, bringing their best dishes to fit this year’s Taste of Tuscany theme, according to a Navy news release. Teams from the carriers Abraham Lincoln and George H.W. 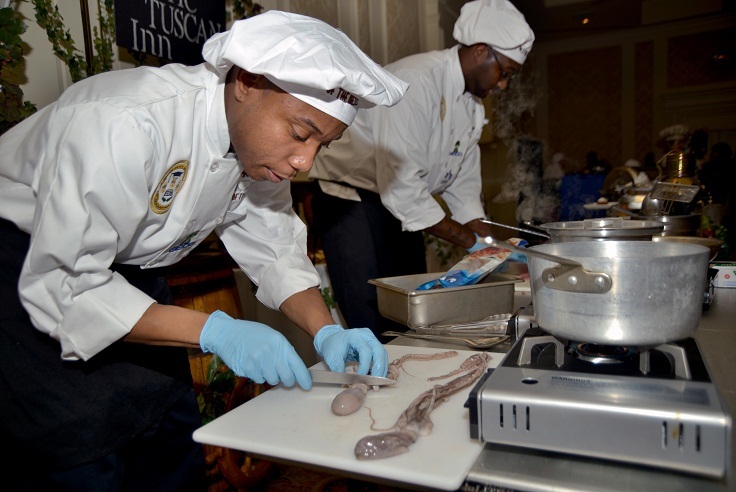 Bush; Naval Station Norfolk, Va.; Naval Air Station Oceana, Va.; Submarine Force Atlantic and the Oak Hill created an appetizer, entree and dessert for the contest, with certain ingredients required — bacon, parmesan or pecorino cheese, lentils, fennel and balsamic vinegar. Each three-man team had an hour and a half to cook enough for 400 guests, and a panel of professional chefs graded the meal on food quality, presentation and interaction with guests. 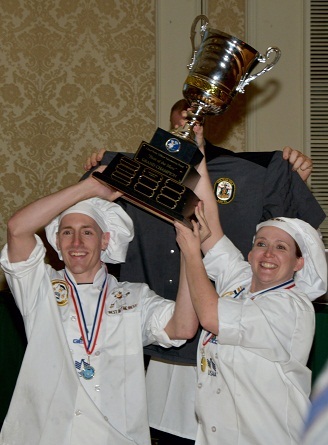 The team from Oak Hill — Culinary Specialist 1st Class Eric Moore, CS1 Cynthia Cruz and CS2 Cameron Tirabassi — came out on top, followed by SUBFORLANT and Lincoln. Oak Hill also claimed the People’s Choice Award, based on a popular vote, with special consideration for the best-decorated table. The event raised $20,000 for CPOSF, which awards higher-education scholarships to dependents of Navy chiefs. Retired Chief Storekeeper David Mazzaferro, the organization’s president, said Best of the Mess raises morale as well as funds. “It gives the culinary specialists an opportunity to show off their skills and training in a way that they cannot do onboard their ships and bases,” he said. Defending champions Naval Station Norfolk handed the Best of the Mess trophy over to its new caretakers, but hoped to take it back next year. “It stung a little to leave without the trophy that had been displayed so proudly in our galley, but its absence will only push us to work harder for next year,” CS3 Engelee Gilmore said.